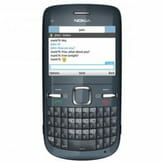 Nokia C3 - Permanently connected to the internet! I bought a Nokia C3 and it seems that the device is permanently connected to the internet. I rarely browse on my phone, so how to disable this feature? Reasons for the permanent connection is a mail service: the account is not resident in the memory of the cellphone but is somewhere on the network (under the watchful eye of Nokia, of course): the application, even if not initiated, by default will connect your phone to the internet (in most of cases, make use of packet data). solution is quite simple: Go to Menu / Settings / Connectivity / WLAN and for connection type, select the "On demand" . Published by jak58. Latest update on October 20, 2012 at 11:40 PM by jak58. This document, titled "Nokia C3 - Permanently connected to the internet!," is available under the Creative Commons license. Any copy, reuse, or modification of the content should be sufficiently credited to CCM (https://ccm.net/).